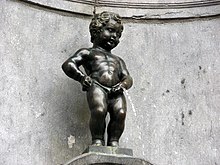 Manneken Pis (alang wi the correspondin female Jeanneke Pis, in limestone) is a bronze sculptur in Brussels, Belgium. Urination is the release o urine frae the urinary bladder throu the urethra tae the urinary meatus ootside o the body. It is an aa kent medically as micturition, voidin, uresis, or, rarely, emiction, an kent colloquially bi various names includin tinklin, peein, weein, an pissin. This page wis last eeditit on 14 October 2016, at 02:48.